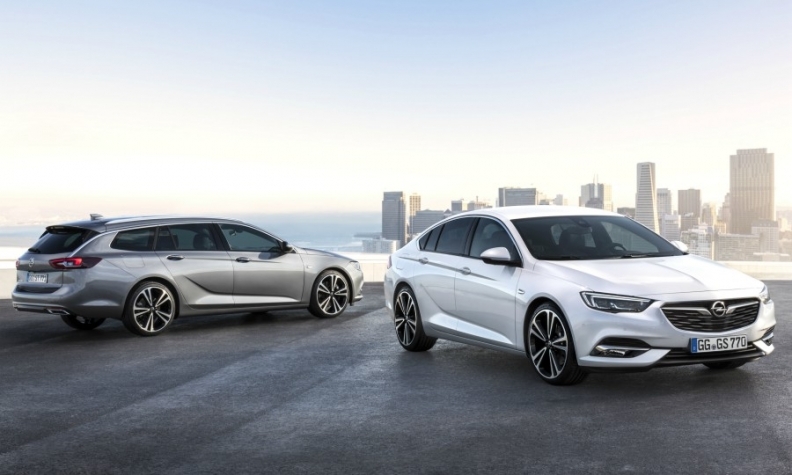 Opel is reducing output of the Insignia Grand Sport sedan, right, and Sports Tourer wagon. BERLIN -- Opel plans to slow production at two German sites after the summer in response to declining sales, regional newspaper Allgemeine Zeitung reported on Friday. The company will cut production to 42 vehicles per hour from 55 at its Ruesselsheim plant and to 30 vehicles from 37 in Eisenach, the newspaper said. Output at Opel's Polish site of Gliwice had already been slowed to 25 from 40 cars per hour, according to the paper. Opel declined to comment on the details of the internal planning. "Of course, we regularly adjust production planning in our plants," an Opel spokeswoman said. The production throttling is sparking concern in the workforce that fewer cars could be built in the long term, the paper reported. But the management said the works council has agreed on its future plans for all European locations. Early last month, the management reached an agreement with workers on investments in German sites and job protection measures until July 2023. Opel builds the Insignia midsize model, Zafira minivan, Holden Commodore and Buick Regal at Ruesselsheim and the Adam minicar and Corsa subcompact at Eisenach, according to Automotive News Europe's Guide to European Assembly Plants. The Astra compact is produced in Gliwice. Opel was sold to PSA Group by General Motors last year in a $2.6 billion deal. In July PSA reported that it had succeeded in bringing the Opel-Vauxhall business back into the black after two decades of losses.